Released in 1968 by Walter Reade-Sterling Productions. In fan circles, some controversy surrounds Godzilla’s seventh movie. Big Duel in the South Seas, called Godzilla vs. the Sea Monster in this country, has been branded by some as marking the creative decline of the series. Yet others praise this film as an interesting and comical adventure story. Unarguably, Godzilla vs. the Sea Monster is an unusual entry in the saga of the King of the Monsters, quite unlike the more explosive previous films, from King Kong vs. Godzilla (1962) to Godzilla vs. Monster Zero (1965). Though far from being the most spectacular of the Godzilla films, Godzilla vs. the Sea Monster certainly deserves a better reputation than some Godzilla enthusiasts give it. Light-hearted and intriguing, Godzilla vs. the Sea Monster is an entertaining escapist story. The island location is an interesting switch from the city locations usually seen in Godzilla films. The characters are well played by familiar Toho actors. All these factors combine to create an enjoyable entry in the Godzilla saga. 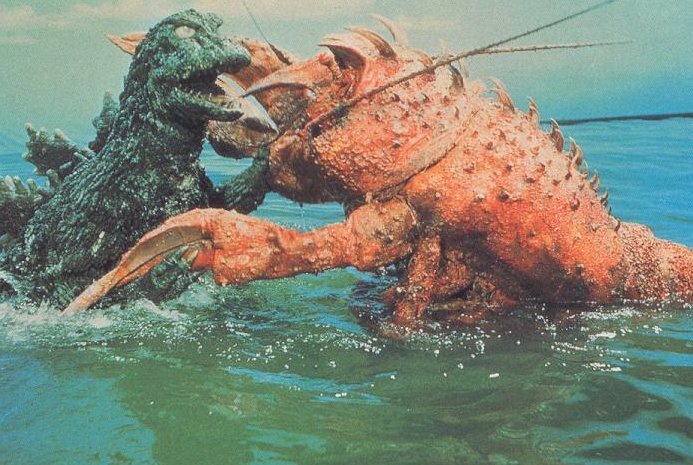 When assessed in the history of the Godzilla series, Godzilla vs. the Sea Monster is indeed an unusual film in many respects. This was the first Godzilla movie since Gigantis the Fire-Monster (1955) that was not helmed by director Ishiro Honda and scored by Akira Ifukube. For Godzilla vs. the Sea Monster, Honda and Ifukube were replaced, respectively, by Jun Fukuda and Masuro Sato. Fukuda had directed The Secret of the Telegian in 1961, yet he had little enthusiasm for special-effects movies, his forte being in directing police dramas. The late Sato, who had scored Gigantis, is best known for his scoring of Akira Kurosawa’s films, such as The Throne of Blood (1957), The Hidden Fortress (1958), Yojimbo (1961), Sanjuro (1962) and many more. Though not as comfortable with the genre as Honda and Ifukube, both men brought their own merits to the series. Furthermore, this change in the creative team resulted in a switch in the direction of the Godzilla series that was needed at the time. Godzilla vs. the Sea Monster was also the first Godzilla film in which special-effects director Eiji Tsuburaya took a less active role, partly due to his health (he was a diabetic) and partly because of his involvement with his own Tsuburaya Productions, creators of the popular (and long-running) Ultraman television series. During the production of Godzilla vs. the Sea Monster, the special-effects direction was left to Teisho Arikawa, with Tsuburaya credited as “Supervisor”. 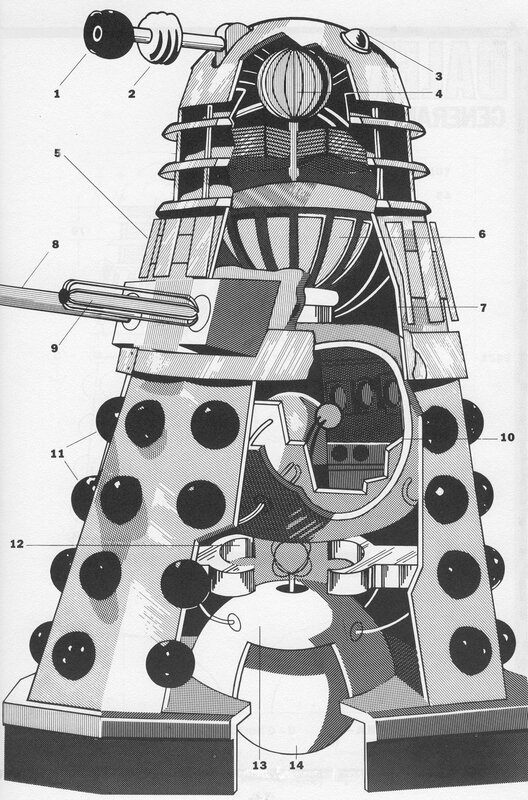 This arrangement would carry into Son of Godzilla (1967) and Destroy All Monsters (1968). Another change in Godzilla vs. the Sea Monster is the island location. To reduce costs, Toho began to film movies on island sets that could be recycled at no cost. This ploy would be used again in Son of Godzilla, Godzilla’s Revenge (1969), Yog: Monster From Space (1970), King Kong Escapes (1967) and Destroy All Monsters, though the last two films also included substantial city settings. If Godzilla acts a little schizophrenic in Godzilla vs. the Sea Monster, it’s because the script was originally intended to be a King Kong movie; Robinson Caruso Adventure: King Kong vs. Ebirah. This film was intended to tie in with the Rankin-Bass’ cartoon series about the mighty ape. Either Toho could not secure the rights for King Kong at this time, or Rankin-Bass (creators of Rudolph, the Red-Nosed Reindeer and other charming Christmas animated specials) were not enthusiastic about the project. Whatever the reason, Toho salvaged the script by substituting King Kong with Godzilla (Toho and Rankin-Bass would ultimately collaborate on King Kong Escapes). This explains why in the finished film Godzilla acts much like Kong. 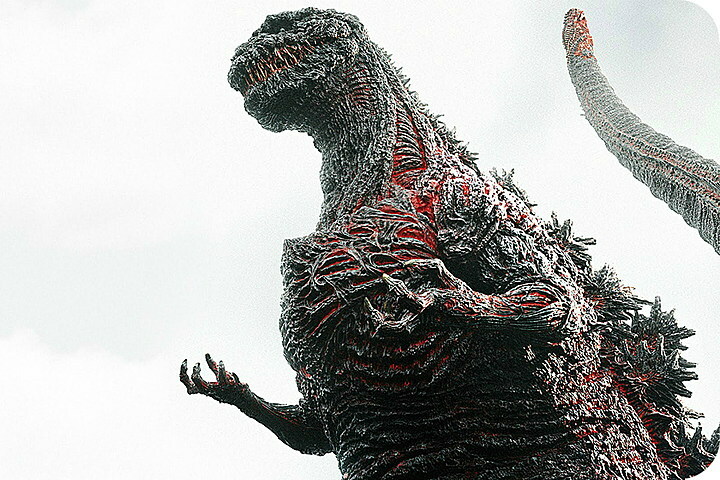 Many of Godzilla’s actions in the movie, such as expressing affection for Dayo (Kumi Mizuno), sitting down to take an afternoon nap, defending himself from a jet attack by grabbing the jets out of the air (albeit he also incinerates the jets with his nuclear breath), and even jumping into the ocean at the finale are all actions that are much more characteristic of King Kong. In terms of kaiju designs, Ebirah is a credible creature, one consistent with Toho’s monsters of the 1960’s. The monsters during this era, such as Speiga and the Gimanites seen in the next film, were mutations of real animals, very different from the cartoony creatures that would follow in the films of the 1970’s. Titled by Toho as Ebirah, Horror of the Deep for international export, Big Duel in the South Seas went to U.S. television sometime in 1968, the title being changed to the much more marketable Godzilla vs. the Sea Monster. For years, it was erroneously reported in American fan circles that this film was released by American-International TV. However, in more recent years, it has been firmly established that the releasing company was in fact Walter Reade-Sterling, who had released Ghidrah, the Three-Headed Monster in 1965. Nevertheless, Godzilla vs. the Sea Monster has the dubious distinction of being the first Godzilla film that did not receive a stateside theatrical release, but instead went straight to television. The American and Japanese versions of Godzilla vs. the Sea Monster are virtually the same, the main difference being the opening sequence. 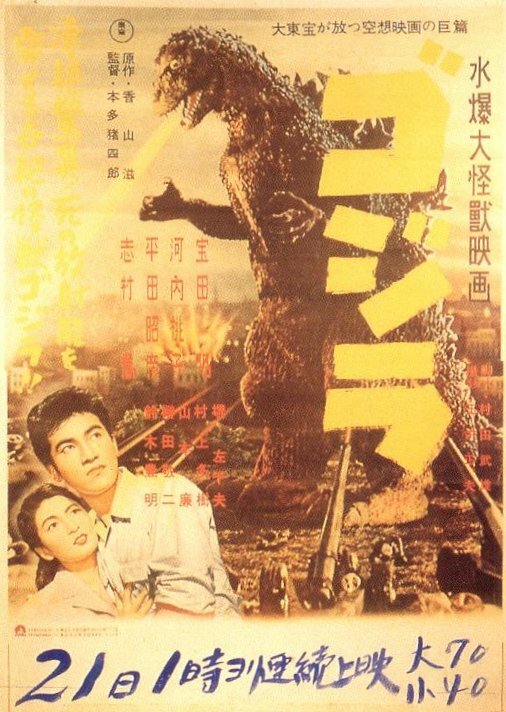 As with prior installments of “Godzilla in America”, differences between the Japanese and American versions are noted by bold face text. –Mother consulting with a priestess. Ruta: I know my brother’s alive! We have to send a boat out right away! Officer: We don’t have a ship in port to spare. Ruta: I’m sure we’ll find him. Let me talk to the police chief! Officer: No, it’s not in our jurisdiction (officer walks away and closes door, leaving Ruta in hallway). Ruta: (Calling after him) Officer! –Scene switches to an office at a newspaper. 1st Reporter: (Approaches editor at desk) Editor? 1st Reporter: I need to see you. I’ve got a problem. Editor: You can’t handle that kid on your own? 1st Reporter: But he refuses to budge an inch! Editor: You thought he would be a good story, so you take care of him! 1st Reporter: (To himself, walking away) What a hassle! 1st Reporter: A ship went down in the South Seas, but a kid is saying that a priestess told him his brother is still alive. 2nd Reporter: (Taking an interest) It’s not very often you find a kid that believes in a priestess’ visions. Where is he? 1st Reporter: Out here. (1st and 2nd Reporters walk to waiting room, only to find that Ruta has left). –The title “Godzilla versus the Sea Monster” is flashed onto the screen (Oddly, the word “versus” is spelt out, something that had not been done before or since in a Godzilla film.) Only a few cords of Sato’s opening theme survived. –Scene of the Yalen during a storm, with Ebirah attacking the ship (This scene appears 14 minutes into the Japanese version. A major goof in the Americanization is that the name Yalen can be clearly seen on the side of the ship. The Yalen is seen peacefully docked some three minutes later in the American version). –Shots of fishing village. A voice-over intones: “Two months later”. There are also a few more minor alterations, occurring from when Ruta, Ichiro (Chotaro Togano) and Mita (Hideo Sunazuka) run into the professional but likeable thief Yashi (Akira Takarada), to when the Yalen is attacked by Ebirah during a storm. · Ruta, Ichiro, Mita and Yashi are eating breakfast. Ichiro: Ruta, you still refuse to turn around? Mita: Where’s the boat going? Mita: To search for him? · Aboard the ship, Yashi is busy working on his trusty skeleton key. Mita: I wonder how far we’ve gone. Ichiro: I don’t have any idea. Yashi: The Yalen seems to be traveling in a southern direction. This is the way I see it. Why don’t we start cooperating with Ruta? If we cooperate long enough, we’ll learn how we can sail this boat. Then we’ll turn it around and head for home. Mita: What are you making there? The tinkering in the American version of Godzilla vs. the Sea Monster does not upset the flow of the film or effect the story. The doctored opening, intended to represent the storm in which Yata’s boat was lost, was probably intended to give the film a more exciting beginning. The deletion of Ruta’s Japanese newspaper clipping was perhaps done because Walter Reade-Sterling chose either not to dub an explanation, or to shoot special footage with an English-text version of the article. The removal of the scene about Yashi’s planning to cooperate with Ruta (in order to take command of the Yalen) is puzzling. Though a minor deletion, this scene demonstrates that Yashi’s ever-crafty mind was at work on how to escape his predicament. That Godzilla vs. the Sea Monster was left nearly intact could be because the film was released directly to television, and that Walter Reade-Sterling felt it was not cost-effective to edit the film extensively. The dubbing is quite good. Hal Linden, later to become famous as TV’s Barney Miller in the 1970’s, dubbed Akira Takarada’s role, adding much to the character of the safe-cracker who’s really not such a bad guy once we get to know him. Peter Fernandez, famous for dubbing Speed Racer in the animated series of the same name, voiced Ruta. However, the American script suffers from failing to mention the name of Ebirah, of Letchi Island, and of the Red Bamboo, the paramilitary organization operating on the island. One definite improvement in the American version occurs during the jet attack on Godzilla. In the Japanese version, this scene occurs to 1960’s-style “surf-n-turf” music. In the American version, this inappropriate music was removed, leaving the scene unscored. Having already placed Godzilla in an island setting and in a script much more light-hearted than some of the previous entries, Toho would repeat this formula for the next film in the series. However, the next entry would also feature one of the most famous (rather, infamous) characters in the Legend of Godzilla. Editor’s Note: In 1994 to celebrate the 50th Anniversary of the first Godzilla film, Tri-Star Home Video, the American distributors of the Toho series released the International version of “Godzilla vs. the Sea Monster” under the title “Ebriah, Horror of the Deep.” The dubbing is the international version and NOT the one released by Walter-Reade Sterling and viewed by fans on American television since the 1960s. While the new release is in wide-screen and contains the complete opening credit sequence, the dubbing, like the ones on “Godzilla vs. Gigan,” “Godzilla vs. Megalon,” and the two MechaGodzilla films, makes this version un-watchable, as the characters now spew unintelligible dialog. Article © 1994, 1997, 2005 John Rocco Roberto, Robert Biondi, Daikaiju Publishing.